I was set to graduate with a degree in Textiles from Rhode Island School of Design when a woman came to speak to my class. She had a position in lace designing available in New York City. It didn’t interest me. I love color and the samples she showed us didn’t have the variety found on printed fabric. But…I was moving to Manhattan with my best friend and two other women who were working there during the summer. I needed a job to help pay for the apartment we had sublet, so I went for an interview. The head of our textile department had given us advice about what we could expect in pay. When I was offered more than the going rate to start, I took it with the intention of looking for something different once I lived in the city. I designed for the Leavers machine which makes lace that looks like handmade bobbin lace. Leavers invented this back in 1813 and the addition of the Jacquard system increased the design potential. The huge machine uses bobbins controlled by punched cards. The lace patterns I designed went into lingerie, bras and women's underwear. Tracing paper is placed over the design and the lines drawn to be sure they go in one direction. 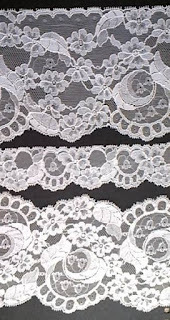 As the lace is made, the pattern is outlined by heavier threads that are always going in the same direction. No thread can go back on itself but the trick is to make it look that way. The challenge for the designer is to make the lace appear as though it’s free of any limitations. A successful pattern (usually a rose with multi-petals) was made in four or more varying widths including an overall fabric. The narrower widths included the strength along the edges for trim on a garment, and at least one width had to include a left and right in the pattern. Making every width appear as though it belonged to the same pattern became the ultimate challenge. Drawing that includes the different bobbin patterns. How many different ways can you draw a rose! I experimented with every flower I could. But any pattern that was terribly distinctive had a short life and a rose could live forever. Vanity Fair, for example, wouldn’t use last year’s lace on their newest garments if it in anyway dated them. All our customers wanted something new and different, yet the same. Too different would kill that design. ﻿﻿ My favorite pattern that included multi-petaled flowers, had delicate lily of the valley surrounded by large swirling leaves. 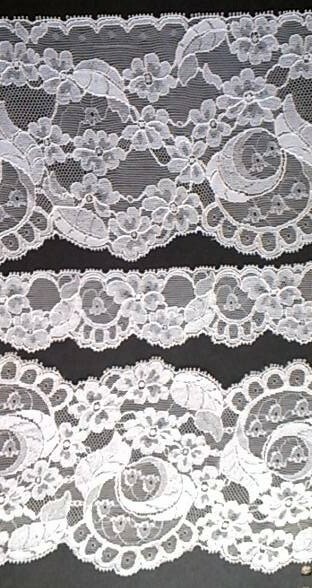 Since lace can unravel, each pattern contained several different widths with strength where the edge could be sewn to the garment. The lower one pictured in the group could be used as is or cut through the middle to create a left and right side used on the bust line. This pattern was too different and wasn't successful. 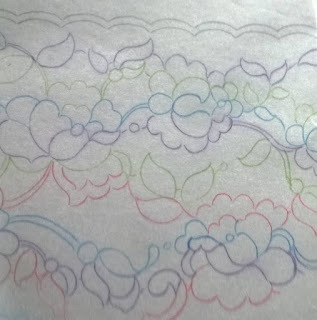 I used this on my wedding dress along with a matching overall pattern, so this was actually made into at least four different widths. Some may think I had a dream job – head designer with my own office on Fifth Avenue, responsible for providing designs for some of the largest lingerie manufacturers. It came with a tremendous amount of tension. After nine years I left that company and found work in printed fabric. Finally, I worked with color, designing textiles and doing repeats and colorings, something I truly enjoyed. However, for the next twenty years, whenever I had any tension in my life, I’d dream that I was back designing lace. I’d wake from the nightmare and wonder how come I was back in that job. We've all had stressful experiences we can pull up from our subconscious and use in our writing. Do you want to share one you've had? Marion, I loved reading this post! I've never thought about how lace is made, and enjoyed reading about it. I particularly liked the photos to illustrate the process. I can appreciate it would have been stressful, but I admire you for such an unusual and fascinating career choice. 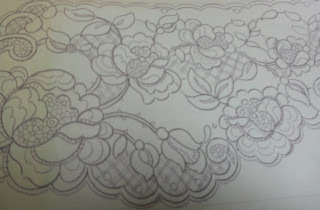 Few people ever believed someone actually designed lace, and I never met another lace designer outside of my company. Wow! Your post was fascinating, Marion. I come from a NYC family of milliners who had a shop for decades reaching as far back as the late 1800s. I have lots of examples of their gorgeous hats up to the fifties and they also made silk roses, lace, dyed bird feathers and other embellishments- all of which I have as well. One of my favorite heirlooms is a pair of 1920s elbow length black lace, fingerless gloves. Very chic and the lace is so fine I'm afraid to touch them! You have had lots of dream jobs, Marion and your creativity in your gorgeous designs and beautiful books is amazing. A stressful time (though I enjoyed it) that I've used in writing is working with at risk kids through teaching. There is an art to working with kids who have authority issues and it took me a while to master it until I could teach the effectively and have them feel proud of their accomplishments. I've drawn on these teens as secondary characters in a few of my books- Wish Me Tomorrow, for example, and my current WIP where a counselor convinces an inattentive guardian to accompany his troubled teen brother on a wilderness therapy program. I had fun having all the teens on that trip act out and grow and learn, along with the counselors and educators and my past experience definitely helped! Karen! I hope you're plotting an historical with all that cool background available to you. I've always thought milliners were amazing. Comes from all those years when Catholic women had to wear hats to church. My mom and I were determined to look cool. It’s wonderful you can draw on your stressful experiences and actually use those to heighten your story. Machine made lace can be surprisingly strong because of the fibers used. However, the lace gloves you mentioned sound very delicate. I’m with you. It’s possible they could rip if you tried using them. This is fascinating, Marion! I never really stopped to think about the people behind the designs of lace, I assumed it was all done via computer or some mass machine. Then again, someone has to program the machine. The work is stunning! Probably the one issue I use in my writing a lot is that darned to do list and characters who are stressed over the mountains of "stuff" that need doing. I'm finding that to be a recurring theme with each book I finish . Thank you so much for sharing. I love hearing about these unknown sides of people's lives. As I was leaving the lace industry, we had people beginning to program the drafting procedures into computers. Computers began to change the whole textile industry to the point where a friend who taught textiles in college had students doing a great deal of their work on the their PC’s instead of with a paintbrush. I'm sure the lace designers followed suit. Marion, I agree with Mel. This is so interesting, but I can imagine it would be hard. Any time you have to pave the way for something new and especially so intricate I think it would haunt you at night. But you are a talented lady in many fields. The internship was supposed to take 6 months, and they didn’t expect anything from me before that. But they made my first design in two months, a very simple flower with a spider web center, that turned out to be very successful on bras. Marion - it's as though designing lace is a physical manifestation of writing a book. All those tricky things to consider that can make or break it. You really are an amazing woman with a wealth of novel material in your past experiences. The most stressful period of my life was a difficult two years when we owned a local newspaper. I got up at 4:00 to be to work at the local bakery at 5:00, because it allowed me to put six hours in before I went to join my husband at the newspaper office. (We weren't making enough for ourselves to pay the mortgage, hence the job.) I typed the police blotter, the classifieds, public records, and we had old equipment that would rip it up on the way to printing it out for paste-up. Then I went home to three disgruntled kids. It was a character-building time. It amazes me how we get through so many problematic times and when we look back, we wonder how we managed. Sometimes the only thing we get out of it is that character building. Marion, wow! What an incredible and fascinating experience! I'll never look at lace the same way. So true about how computers have changed the way everything is done...down to artistry. Now, when a heroine of yours inherits a family heirloom made with lace, I'll see a rich history behind it ;). I’ve never been able to incorporate designing lace into one of my stories. 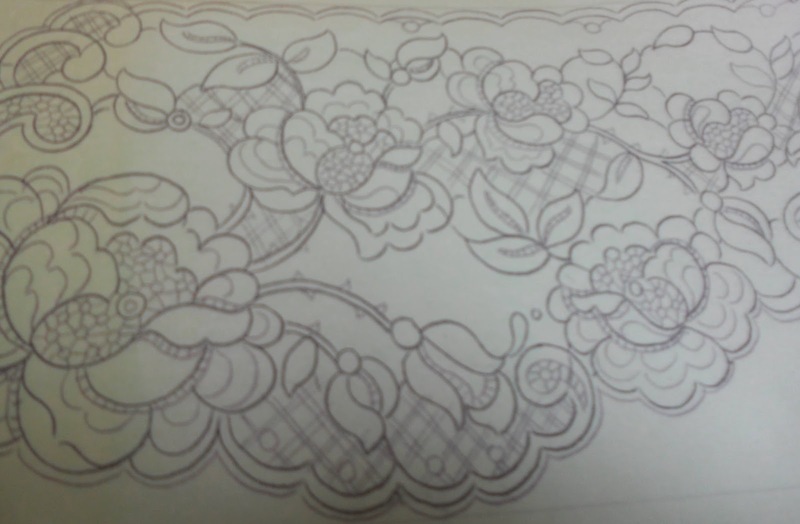 However, I did take a course on how to make bobbin lace. I spent weeks on it and came up with only a few inches. But maybe that would be a way to go. Next time I buy a lace bra, I'll think of the designer behind the lace pattern. Stressful, but it must be rewarding to see the fruits of your labors so tangibly displayed in a finished product. In college, I had a summer job as a cook in a rest home. The work was almost impossible for me to finish in the allotted time, and they wouldn't pay overtime that wasn't pre-approved. Still, I learned a lot, met interesting people, and got a few funny stories out of the deal. Besides the character building Muriel mentioned, those strenuous jobs also included so much more, including wonderful friendships. Marion, I'm with everyone else, I won't be looking at lace the same way again. I used to do some embroidery but never got good at it. Stressful experiences, there's quite a few but perhaps what helps me most is recalling my first job at a children's hospital working with parents of children with special health care needs. The resilience of the children and families really helps me remember the power of the human spirit. Dealing with people in a hospital with special needs – that really tops the problems I had. I also worked with people who added embroidery to the bras, and slips and they had to incorporate their patterns so that they matched mine. Marion, those designs are lovely. A hidden talent of yours that I did not know about (smile!). Thank you. I wish I could find the top of my wedding dress with the overall pattern that matches the Lily of the Valley design to show how all of it could be integrated. I tried taking pictures of it from my wedding album but the lace didn’t show up well. Wow! What a cool experience, Marion. I would imagine that took a great deal of patience. I get frustrated trying to sew a button. You're my hero! At times, I'll use my emotions, with my mother's struggle with dementia to fuel my writing. It wasn’t so much patience as it was frustration. I’d look at the blank paper, similar to looking at a blank page in the computer, and wonder what can I do this time? I'd love to see this in a book. It's so interesting. Kathleen Gilles Seidel wrote a book, Please Remember This, in which the heroine was a collector of heirloom lace, etc. It was interesting, too. I'm sure you could use it somehow! Thanks for the suggestion. At this point I don't see that story in my future. Wow. That was so interesting!! My most stressful job was hanging wallpaper. I'd get up at 4:30 to write (which turned out to be the first one I sold) for 2 hours, then gather up the tools and go hang wallpaper. The worst job was wallpapering condo bathrooms in November, during construction, with the windows and doors open and the wind blowing in from the lake. The paste kept freezing! I’ve hung wallpaper many times, and I can’t see how what you described would even be possible. The paste freezing? Wow, what a tension filled job. Thanks for your input.